When you have a dog in The Bahamas and you need to take that animal to the United States, do you know what is required of you, or do you suddenly panic and scamper around the place phoning everybody and getting all sorts of different “very helpful” answers and then spend the rest of the day trying to sort out through the rubble as to which person actually got it right? Thank Goodness for Capt. George Pierce and the Caravan that Saga Boys Holdings Charter Flights operates out of Odyssey (the old Million air). 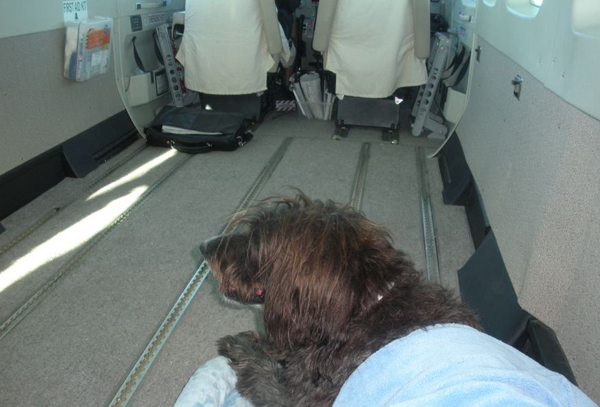 It is a nice roomy, airplane and the dog can sit on the floor in front of his owner. A huge improvement from having to put the poor animal in a cage in the belly of the aircraft all alone in the dark with no reassuring hand on his head to tell him that it is all okay. Abba snuggled right down and had a nice sleep over. Abigail in the Caravan, flying from Nassau to Ft.
You need to have a health certificate issued no more that 24 hours before traveling for the States. This certificate has to state that your dog is healthy and has no communicable illnesses; it will also list all the vaccines and on the dates that your dogs has had. This is the only document you will need to get Fido into The US of A. You need to go to the Ministry of Agriculture and Fisheries and apply for an import permit to bring in your dog. This costs $10.00 and takes anywhere up to 3 days to be issued. You need to get this ahead of time. You cannot import a dog under the age of 6 months. It is all pretty simple. Everybody at the Ministry was very friendly and one lady kindly pointed out to me that if we were going to be doing this trip several times, I could apply for several import permits at one time so that I do not have to keep coming back week after week. I really appreciated that information. On Monday I will go and pick up 5 individual permits, which should cover all of Abigail’s medical trips this year. Somebody told me that you can get a multiple entry permit, but I am not sure about this information, it certainly was not offered to me. Going through US customs and Immigration was simple; they looked over her documents, and asked a couple of questions. Coming home was much the same. Abigail was pretty cool during the entire trip. She liked the rental car, and fell asleep in the roomy back of the Sienna. This allowed me to do so shopping at Barnes and Noble and a few other favourite shops. i was always careful to park the car in the shade and away for the busy areas, so she could be peaceful. Finding a hotel was a bit more complicated. I went on line looking for dog friendly hotels. The first five I called were NOT dog friendly any more. 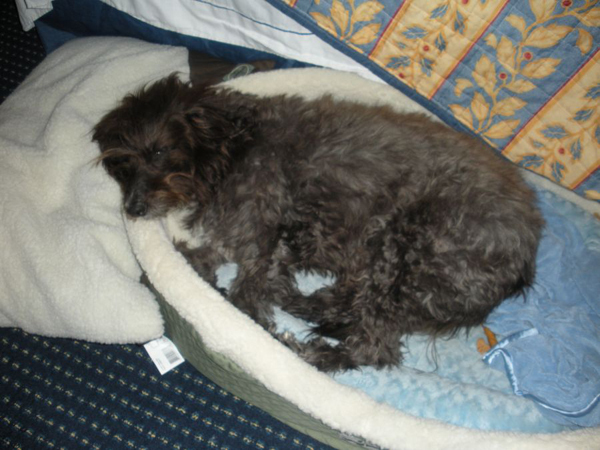 I finally got on to Residence Inn, who were very friendly, and for a one time fee of $100.00 (no matter how many days you stay) will accommodate your dog. When you arrive they give you a “Pet in Room” sticker to put on your door so that your pet will not be disturbed if you go out. There is also a form to fill in to schedule when the housekeeping comes in to do your room so that you can either be there or take your dog out. There is a kitchen area to store and prepare your pet’s food. Abigail and I were very comfortable indeed. There is a nice garden area to go for little walks (don’t forget you pooper scooper). 242 702 0200 (Racquel will probably help you book). That service made a world of difference to me !!! if you are flying over for medical reasons, or just traveling with your pet the above information should help to make your trip easier. Remember to travel with you dog’s bed, that way in the plane, in the car and in the hotel he will be reassured because his bed is familiar and makes him feel safe, a couple of familiar toys are a good idea too. While we were over in West Palm Beach, I took Abigail into Pets Mart to shop. 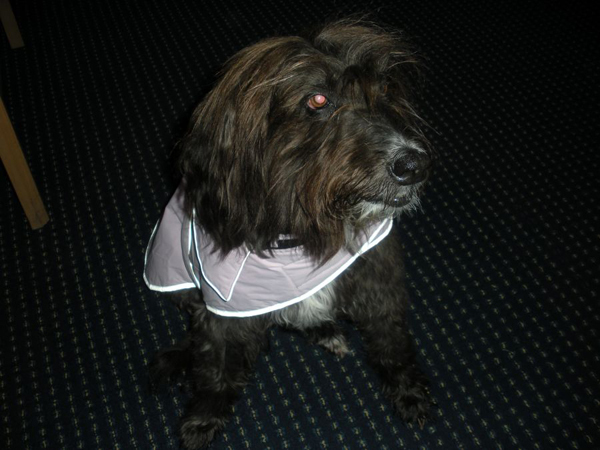 It was so cold I bought her an over coat. It was the fist time she had ever been in a shop. Here in the Bahamas she would most certainly NOT be welcome. I think she enjoyed the experience.